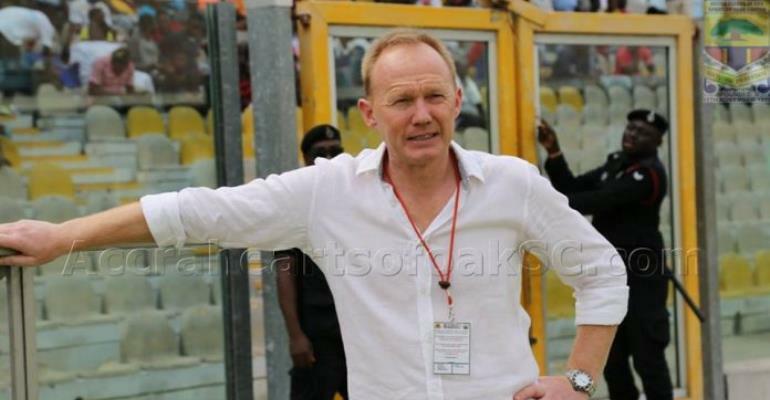 According to the Administrative Manager for Accra Hearts of Oak, the club will not pay any amount of money to compensate for sacked coach Frank Nuttall. The former Scottish trainer was shown the door by the Phobians after failing to abide by the code and conduct of the club on Thursday evening. A three-member committee was instituted by the board of the club to investigate the dealings of the coach after he was accused of advising players not to extend their contract with the club with the pledge of getting them a new club abroad. On Thursday, the club officially confirmed they have parted ways with the former Zamalek trainer but will not pay any money to compensate him but mentioned that the club owes Frank Nuttall a month salary. “We have served him a letter that his engagement with the club has come to an end. “We owed him one month salary before the issue happened but aside that we don’t owe him any compensation. Meanwhile, he also urged Kumasi Asante Kotoko supporters to exercise patience and give the team some time to build. “I believe the Asante Kotoko supporters should exercise patience for the team. They not able to qualify does not mean the team is bad. "They should know that hard luck and the delay of the Ghana league or lack of league competition caused their early exit”, he added.